Above is a photo of Kochius hirsuticauda. 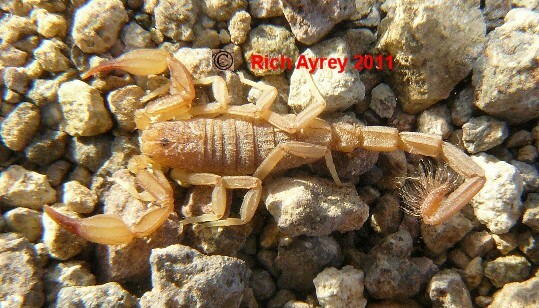 This Arizona Scorpion pic was taken near Parker, Arizona. Kochius hirsuticauda is also found in Nevada, California and Utah. This Arizona Scorpion was previously known as Vaejovis hirsuticauda. We are fortunate to have pics of such uncommon Arizona Scorpions. This Flagstaff Arizona Scorpions site copyright Rich Ayrey 2009 - 2017. Arizona Scorpions World page created 03/03/09. Arizona Scorpions World page last updated 01/15/2017.